Personally, what I like about Avast Pro Antivirus 2014 is, it’s one of the proactive security software. It can detect and remove viruses before it infect your PC. The virus definition updates is almost real-time. The alerts can be customized. In terms of features, safezone and sandbox are just two useful things that make it worth buying. The installation is fast for less than two minutes Avast Pro Antivirus 2014 is ready to protect your PC. There are two types of Avast Pro 2014 installer, the online installer and offline, I suggest to download the offline because it performs faster installation process and you can install it without the need of internet connection. Avast Pro Antivirus 2014. What’s new? It detects your basic software updates such as Google Chrome, Firefox, Internet Explorer, Flash Player, PDF reader and more. Please take note that unless you upgrade to Avast Premiere it will not automate your software updates. Nevertheless, at least it will give you information about your software and you can manually update each via Software Updater by hitting the Update. If you are unsure of your software or application that you downloaded from an unknown source, you can run it in Avast Pro Antivirus 2014 Sandbox. To prevent it from installing harmful software or scripts on your computer. This is ideal for software and application testing. Are you doing shopping online? Did Banking Online become your habit because of the convenience it brings? Now, you don’t have to worry about hackers stealing your financial records. Avast Pro Antivirus 2014 SafeZone will do the work of protecting your online transactions. All you have to do is to input your favorite shopping and banking website inside Avast Pro SafeZone. Browser’s unwanted extensions have become one of the most annoying problems with user’s browsing experience. It is also a very common knowledge that it is installed without the user’s permission because it hides itself from pop-ups and software. That’s why, Avast answer this issue with its Avast Pro Antivirus 2014 Browser Cleanup. In order to take advantage of it, simply navigate to Avast Pro Antivirus “Tools” and select the “Cleanup” then “Start”. Wait for a few seconds, as it scans your browser plug-ins and display an option to “Remove unused or useless browser plug-ins. 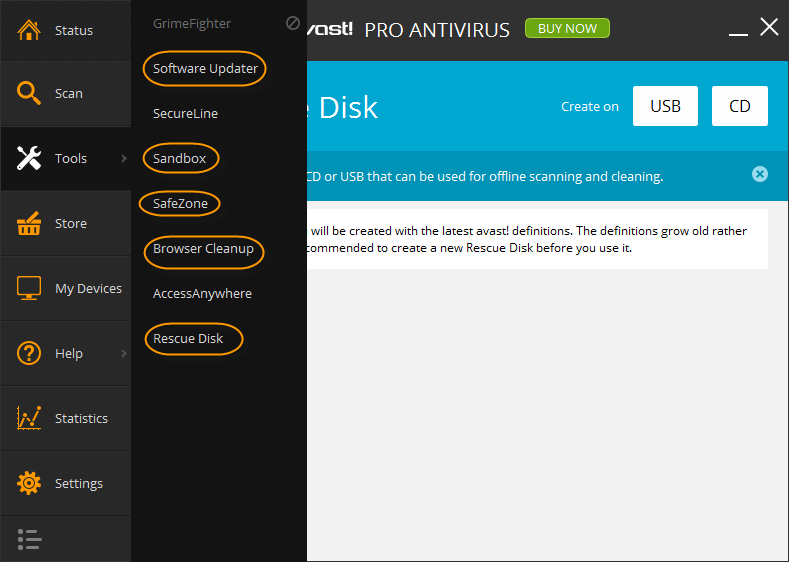 Avast Pro Antivirus 2014 also includes Rescue Disk. Its purpose is to create a virus scanner via Flash Drive or CD. This is useful for scanning your storage devices offline. However, the virus definitions may become obsolete in just a couple of days. Therefore, it is recommended to create your Rescue disk in Flash Drive for flexibility and you can easily create one on the go without buying another one compared to CD. By default, Avast Pro Antivirus 2014 File System Shield, Mail Shield and Web Shield are set to ON. Each setting can be customized according to your needs, but leave the recommended settings as is, if you are not sure about your changes. Avast Pro Antivirus 2014 improves its virus definition intelligence with its Reputation Service. Plus its DeepScreen technology as well as Hardened Mode is added to make it better in terms of Real-time Protection and newbie Avast Pro users.When it comes to settings, especially the Exclusion list, you can add a file, folder and URL in it. All those that’s been added in exclusion list shall be excluded from Avast Pro Scans. Just make it sure that those files are safe, scan it first for your security, especially the one that you don’t personally possess. You can customize your Tray icon by showing it, animate or completely hide it from your task bar. If you don’t like the Avast Pro Antivirus 2014 sound alert, just unchecked it in appearance settings. You hate Avast Pro popups or you just simply want to shorten the time it is being displayed? You can get rid of it by setting the time to 0 from 20 seconds or adjust it according to your own discretion. Avast detection rate as of the latest AV Comparatives latest test results dated March 2014 is 97.7%. It also got 95% in False Positives Rate. The results are not really the best, but good enough for a reasonable budget. Avast Pro Antivirus can run even Pentium 3 CPU, 126 MB of RAM and less than Gigabyte hard disk space. It also supports almost all Windows Operating System from Windows XP (SP2), Windows 7, Windows 8 and Windows 8.1, 32 bit and 64 bit are supported. Now, think about it, how seamless it could be in your brand new hardware. Frankly speaking, it is not the top notch antivirus. However, it is one of the best available in the market with just $34.99 yearly subscription. The price is reasonable. The protection is commendable. In my experience Avast! Pro Antivirus is a good shield against viruses, but if you install it into already virus infected PC, it can remove common viruses except Shortcut Virus. Avast! Pro was able to neutralize Shortcut Virus but failed to remove it automatically. You need to manually delete it after Avast Pro scans. Avast! Pro detects legitimate web ads, especially pop-ups advertising. Unless, you don’t install the Avast! Online security plug-in for browsers. While it is a good idea to have it in your browser, it may cause lag on certain websites that sometimes includes search engines. What do you think about Avast! Pro Antivirus? Feel free to express your thoughts with us.